The authors have theoretically based and experimentally verify laws necessary for constructive and technological optimization of the crucible melting furnaces. The new constructive and technical decisions raising mobility, safety and economy of furnaces are shown. Complex action on liquid aluminium alloys by the current and agitation of molten metal in induction furnaces leads to refinement of all metallic and nonmetallic alloy components and improvement of their casting process properties ensuring the production of solid and impermeable castings. The main problem of remelting aluminium alloy scrap based on cans is the active formation of oxide skin over the melt' s volume because of the large area of the surface being oxidized and the presence of a two-layer lacquered coating based on hydrocarbons . Investigations have shown that the most rational and cost-effective is the re-melting of compact packaged medium-compaction charge consisting of aluminium cans when being treated with a new coating-and-refining flux of higher ecological cleanliness based on refractory and heat-insulating materials resulting in a 92 to 95% yield. Lasenko V.V. et al. Effect of Fluxes in Electroslag Re-melting of Steels on the Improvement of Environment-Friendliness of their Manufacture and Metal Product Quality The flux being used plays an important role in electroslag remelting. Properties of experimental fluxes were determined in comparison to the commercial grade ANF-6. The oxide, sulfide and oxysulfide inclusions content in the experimental metal is virtually 2 times lower than in commercial meltings carried out using the ANF-6 flux. Conditions for producing massive nanostructural materials using information properties of self-organizing nanotechnologies on the example of using the method of intensive plastic deformation allowing to control the dynamic stability of a nano-system of machine-building materials are discussed. It has been shown that the structure formation during the transition of the system to the nanoworld is controlled by the self-similar relation between the feedback code determining the stability of grain boundaries in machine-building materials and the degree of adaptability of the system to the discrete increase of the nanograin size. As a result of thermodynamical analysis of the processes of crystallization and melting of nanocrystals it is shown, that interface surface tension on the boundary of liquid metal with nanocrystals is linearly dependent on its radius. This seriously decreases interface surface tension of nanocrystals and makes them thermodynamically stable in liquid metal. Presence of surface-active elements in molten metal seriously decreases intensity of coagulation of nanocrystals in the center of crystallization and increases overcooling during crystallization. Crystalline GL-1 and fine-dispersed С-3 graphites were investigated. The persulfate process was selected to obtain expanded graphite. The obtained oxidized and expanded graphites were tested in compositions of suspensions, burning-on preventing washes and coagulation-and-sorption compositions for treating foundry waste water. It was concluded that the water so treated can be used in the foundry' s recycling water supply for technical needs. Experimental data of a particular case of fluctuation crystal nucleation in liquid solutions from two centers are reported. These centers are zones of maximum and minimum solution density (concentration) . As a result of the fluctuating (wavelike) interaction of these centers zones of higher density (concentration) are created in the solution, in which a multi-site crystal nucleation occurs. Lykasov D. K. et al. Effect of Duration of Homogenizati-on of an Aluminium Alloy Ingot on its Microstruc-ture An effect of duration of homogenization on the phase composition, microstructure and character of temperature dependence of heat capacity of an aluminium ingot has been established. It has been found that an increase in the homogenization time results in a considerable decrease in the average grain size with the microhardness value remaining virtually unchanged. It has also been found that an increase in the homogenization time of an aluminium ingot over 12 hours is ineffective, because it does not lead to any considerable increase in the amount of strengthening phase precipitating at artificial aging, and any increase in magnesium content in the solid solution due to the homogenization of the ingot. A specialized department for resources-saving electroslag technologies created at GP NPKG Zorya-Mashproyekt is described. Brief information on the process equipment installed in the department is given. The technical data of the main process equipment are given. The main materials from which billets will be made are indicated. Expediency and availability of the department are shown. The possibility of dispersing the structure of cast copper anodes using thermal cycling is discussed. Grain dispersion from 780 цт in as-cast condition to 100-300 цт as a result of thermal cycling in the temperature range of copper alloy quenching has been established. Dubinin A.M. et al. Application of Heat Balance Model to Calculate the Rational Speed of Casting Aluminium Alloy Ingots A model of solidification of ingots from grades 2007, 2011 and 6012 Al alloys based on the heat balance equation for sliding crystallizers of different diameters has been developed. The model allowed to determine the optimum casting temperatures and speeds. 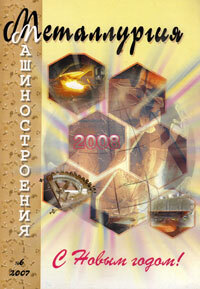 Designed casting conditions for said alloys have been checked under production conditions. Ingot properties meet the DIN requirements. Rate of ingot cooling in sliding crystallizers eliminating crack formation has been calculated.